June 5th, 2008 : Sunny and Warm, Water Temp 80* and Clear. The guys wanted to go catch bait with me this morning so we left the dock at 4am and caught bait, picked the girls up at 5:30 and went fishing. Set up over a 25 foot flat pulling big Gizzards on Boards and Herring on downlines. Had a couple of fish hit at the larger Gizz but did not hook up until we got over a little deeper water then all the lines went off. Today we worked schools over flats from 30' to 40' deep, later in the day going exclusively to downlines. A couple of times we found some very dense schools of Stripers and had plenty of action. We had about 150 strikes today, boating 16 Stripers and a bunch of Cats. 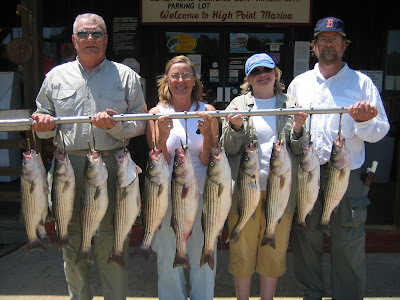 Now that the water has warmed up the Stripers should school up well and hopefully within the next week our catches should be up to where they were this time last year, 30 to 50 fish a morning.